Profile: Paranoia is the character trait that makes Red Alert as good as he is at his job. Nothing escapes his notice - a whiff of smoke, a whisper of crackling electricity, a faint scent of fuel exhaust. Anything, no matter how small, that triggers his sensory circuitry directs his thoughts immediately to the expectation of trouble. Most of his comrades find his edgy, driven nature an unwelcome presence among their ranks, but they all appreciate his dedication to his duty. "He may have a few wires crossed in his logic center," says Inferno, "but at least his optical sensors are looking straight ahead." 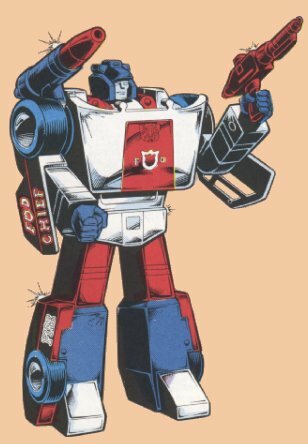 Abilities: Red Alert can trigger an electronic alarm on each of his fellow Autobots. His sensory perception is excellent. His visual acuity is such that he can pinpoint a 2 cm microchip at 1200 feet. He can hear a pin drop - at a distance of 1.4 miles! And his olfactory module can detect odors as weak as 2 parts per million. In vehicular mode he is among the fastest of the Autobots. In robot mode he carries a shoulder-mounted rocket launcher that has a 25-mile range, and a high-energy particle beam rifle. Weaknesses: Red Alert's paranoia and nervousness make him susceptible to rash judgments. Consequently, his actions can be injurious to both himself and his fellow Autobots, if he's not careful.